WLA Magazine seeks to showcase great landscape architecture projects and in this 27th edition we continue this by publishing 15 great projects from all corners of the world. 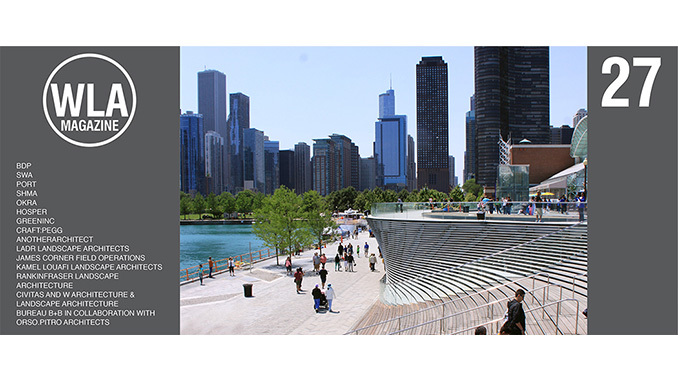 Featuring Navy Pier Phase 1 in Chicago on the front cover this edition features the JAMES CORNER FIELD OPERATIONS project. In this edition we explore an eco-luxury resort in Nicaragua, Casino in South Africa, small scale green roof in Canada, art installation in London, pedestrianised street in Austria, future E-City and new shared street in the Netherlands, a striking plaza in Germany, therapeutic garden in Scotland, community Mall in Thailand, a major redevelopment of a park in Canada, a future satellite city in Russia, a reinvention concept for Chicago, and unique waterfront in the UK. We never fail to provide a diverse range of projects that excite and enthrall our readers.